Turkey's domestically produced UAV Bayraktar TB2 was developed by leading unmanned aerial platform developer Baykar Makina. The Turkish defense industry is developing an electromagnetic launch system for unmanned aerial vehicles (UAVs) that would allow ships to launch drones without a runway, increasing naval platform deterrence. The Turkish navy operates a series of local aerial platforms, including ANKA and the Bayraktar Tactical Block 2 (TB2). But the aircraft can only take off using conventional runways. The U.S. and China already use electromagnetic launch systems aboard some of their aircraft carriers. The system is simple to use, cost-effective and boasts high-power launch capacities. The Turkish defense industry has been working on electromagnetic rail guns, which are based on the same principle, for some time now. The project has enabled the development of electromagnetic launch systems because of common features, including power supply, high current/voltage switching and control systems. Potentially, electromagnetic launch systems can make a huge contribution to the effectiveness of the Turkish Navy and its ability to operate drones. For instance, the Bayraktar TB2 will be effective at a range of 100-150 kilometers when launched from a navy vessel. This will significantly boost the navy's security and deterrence capabilities in the Aegean and the Mediterranean Seas. Thus, a new UAV development process will not take years, and Turkey will acquire a system that can be integrated into existing national platforms. Yeteknoloji AŞ, who introduced Turkey's first electromagnetic rail guns, also manufactures components for the electromagnetic launch system. In response to the need that may emerge with the navy's use of UAVs, the company decided to develop an electromagnetic catapult. Yeteknoloji AŞ has launched a conceptual design project in this regard and aims to launch a 750-kilogram UAV with an electromagnetic launch system within the next two to three years. Yeteknoloji AŞ General Manager Fazıl Hızal told Anadolu Agency (AA) that the electromagnetic launch systems have rapidly been adapted for different applications, including weapons, like railguns, and launch systems, said Hızal, adding that such technologies should receive more attention due to the country's needs. Noting that the U.S. and China are working with electromagnetic technology, Hızal said the U.S. is already using this technology. It can launch aircraft and UAVs using an electromagnetic launch system. "China is also expected to start using this technology soon. We, as a country, must also join this technology race. We have technologies that can be part of this race. We can make the best UAVs in the world and produce all the components of the electromagnetic launch system in Turkey," he said. "So, we can develop our own system and launch UAVs from vessels. This technology will provide our armed forces with very important capabilities." Bayraktar TB2 armed drones, produced by Baykar and operational since 2015, have been used to support Turkey's fight against terror on its southern border and during cross-border operations in Syria. 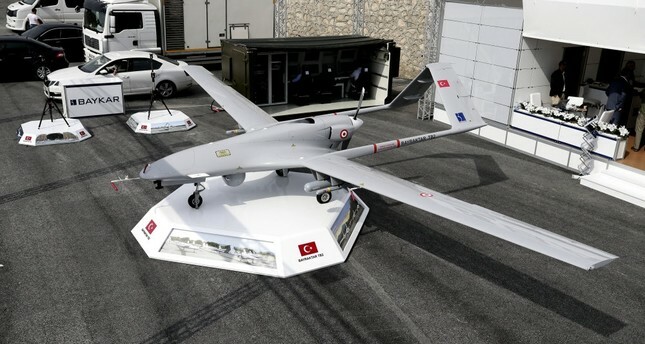 The domestically developed drone is the first and only armed UAV in the Turkish Armed Forces' (TSK) inventory. With its advanced electronics, software, aerodynamic, design, submarine systems and flight automation and performance, the Bayraktar TB2 is one of the most advanced UAV systems in its class. Performing active reconnaissance, surveillance and intelligence flights, the Bayraktar TB2 has the ability to transmit images to operation centers without delay and engage targets. It boasts a service ceiling of 8,239 meters (27,030 feet) and a flight endurance of 24 hours. It can carry 150 kilograms (330 pounds) of payload and can be operated day and night. On the other hand, ANKA, an advanced Medium Altitude Long Endurance (MALE) class UAV, performs day and night, all-weather reconnaissance, target detection/identification and intelligence missions, featuring autonomous flight capabilities, including automatic takeoff and landing.